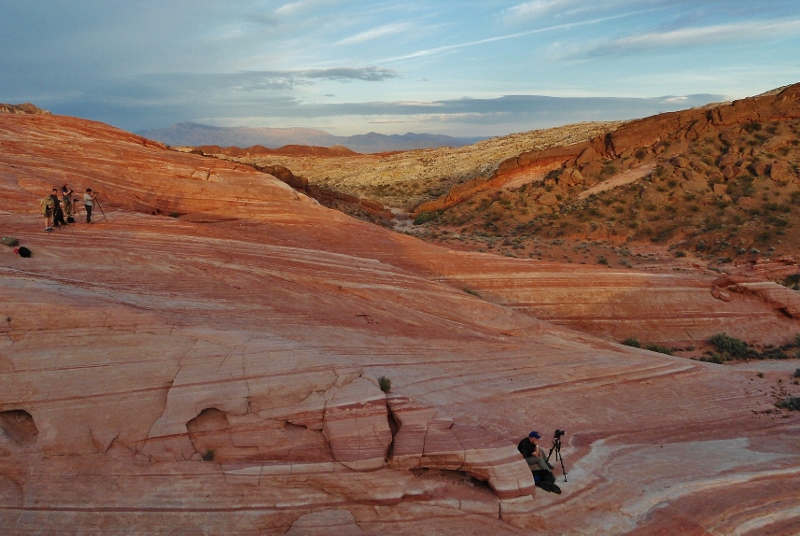 After the bright lights, noise and crowds of Las Vegas we needed to get back out doing what we like best, exploring gorgeous, interesting natural places. 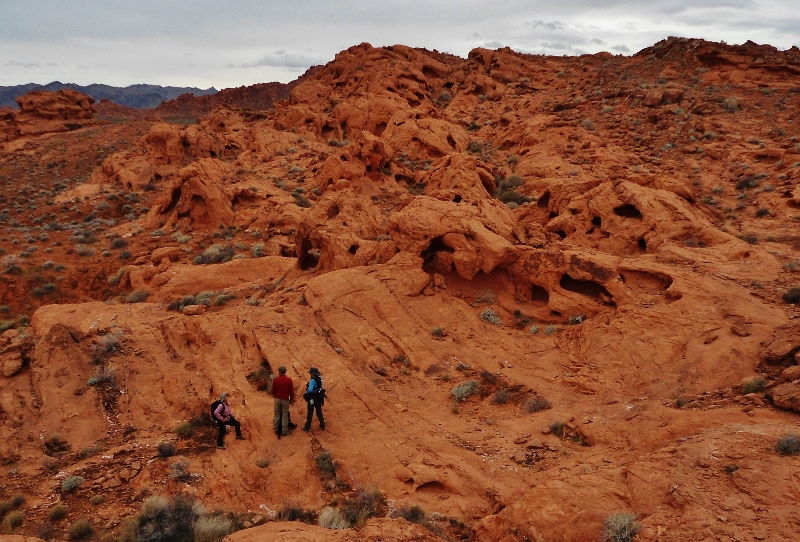 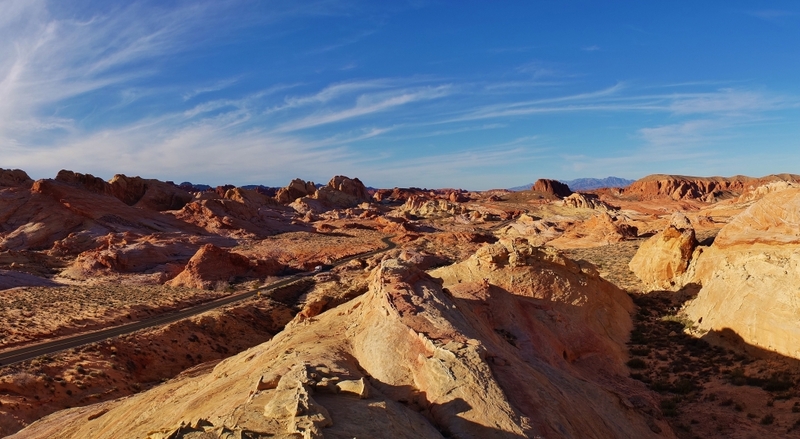 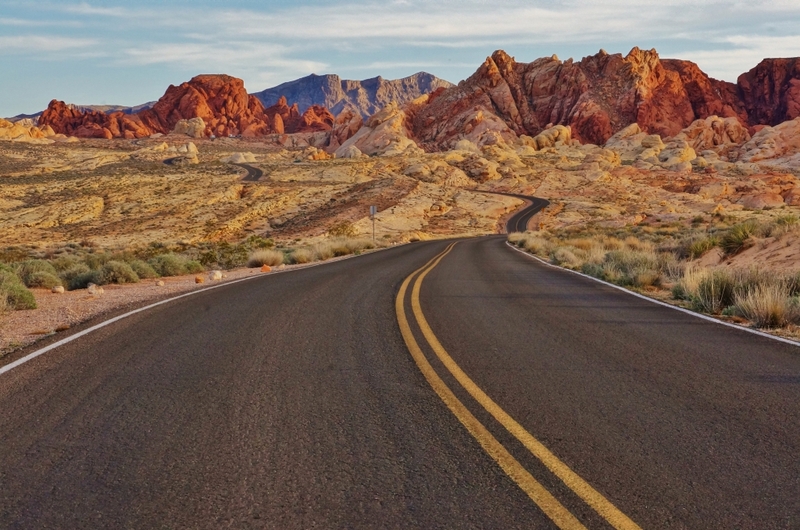 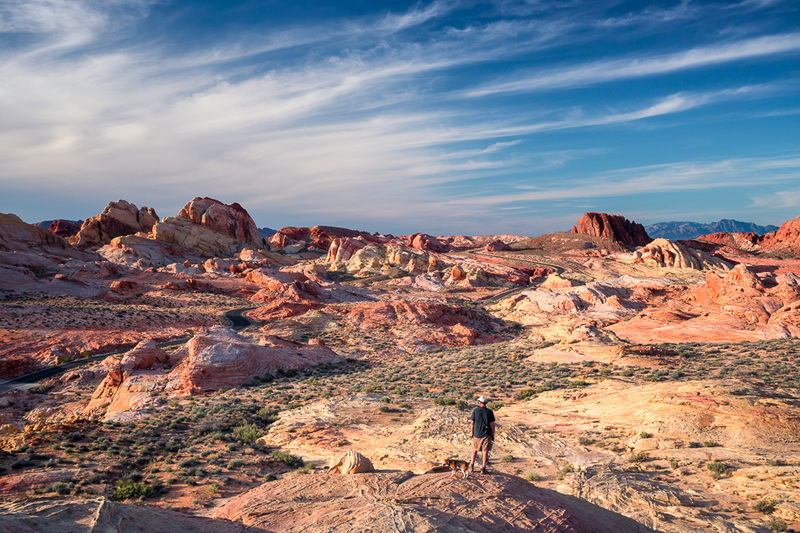 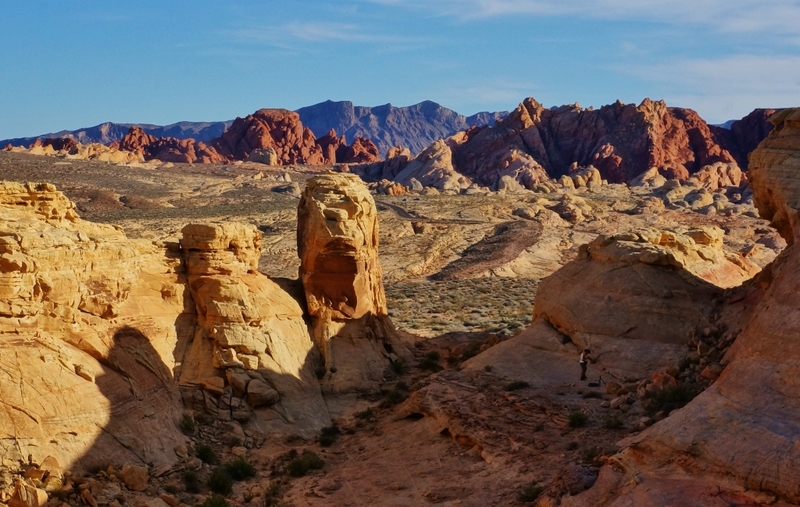 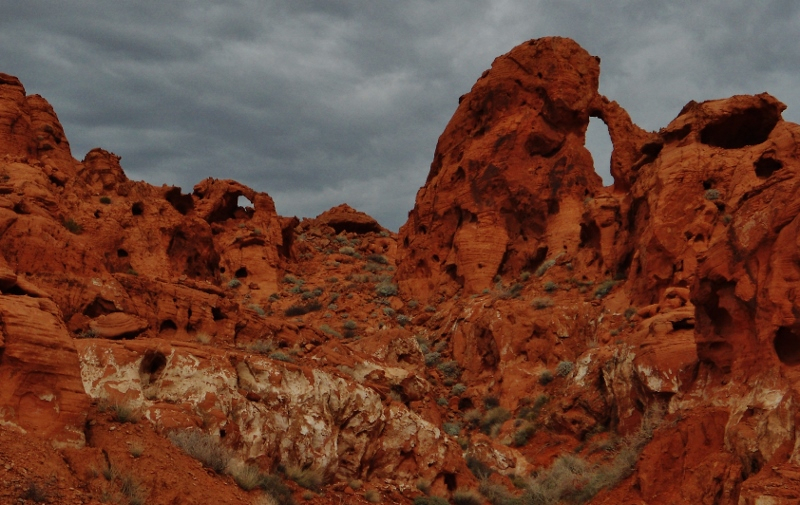 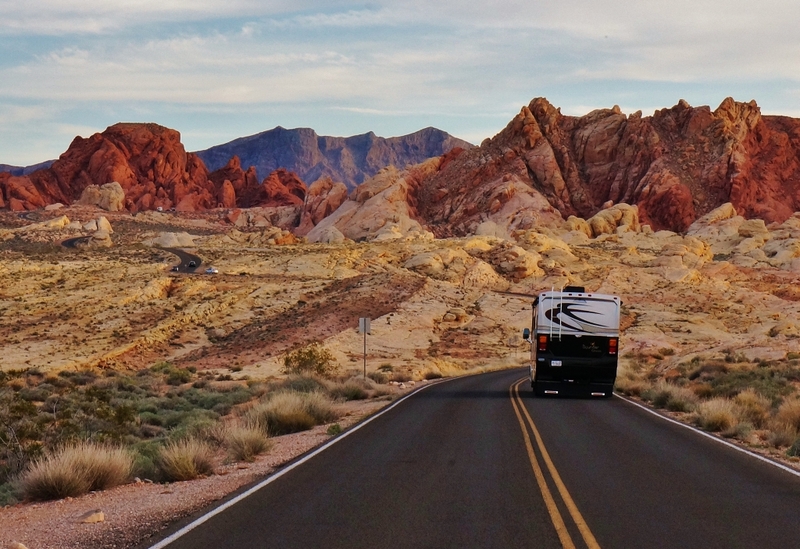 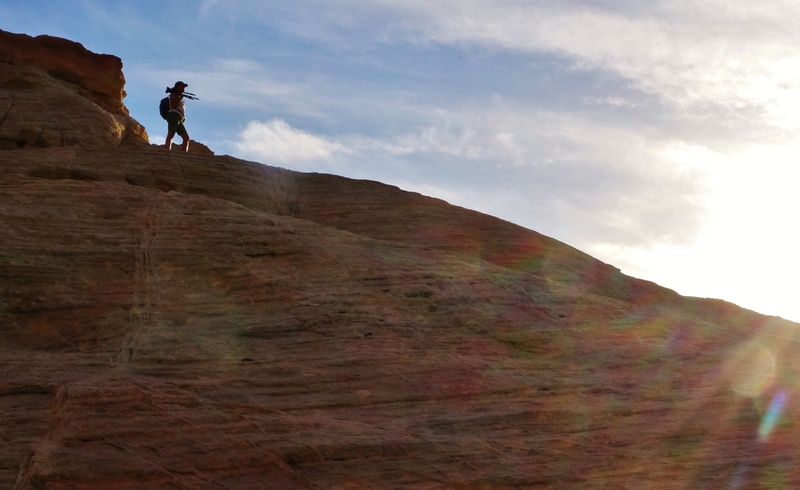 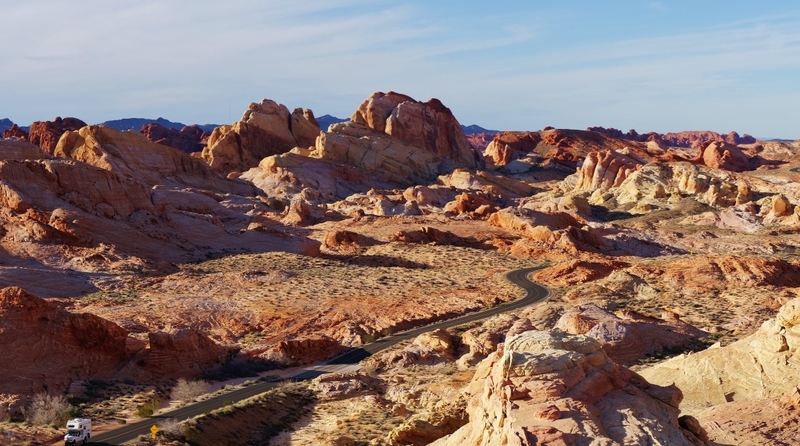 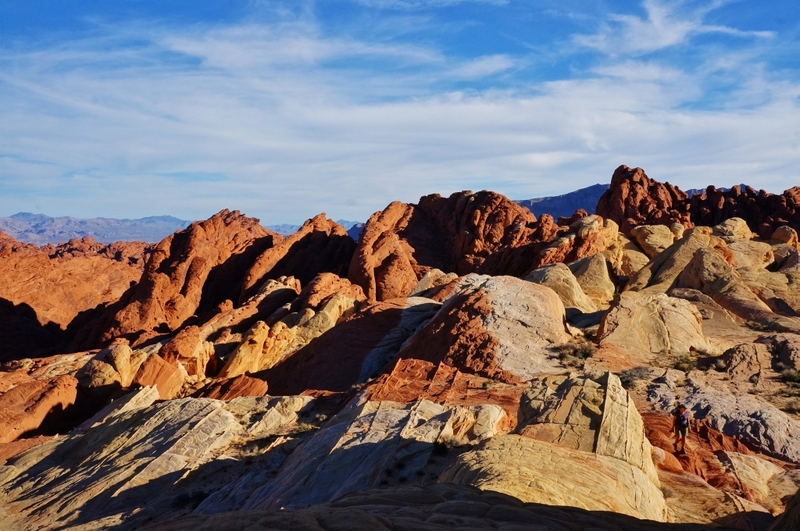 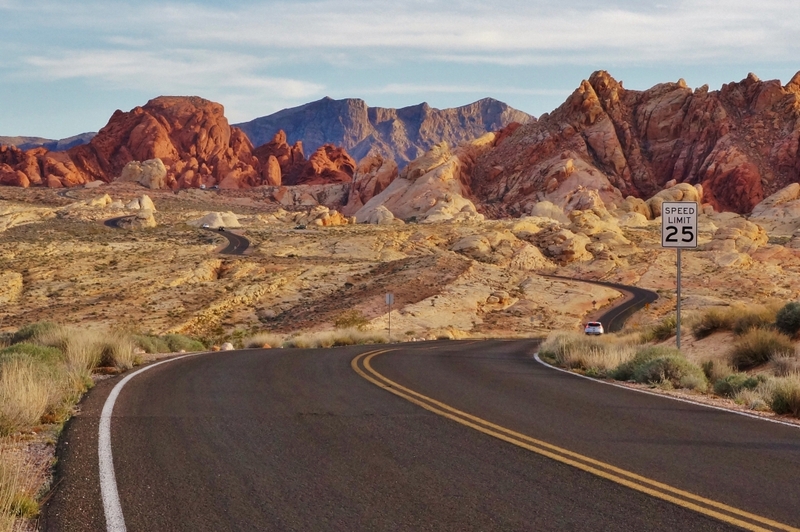 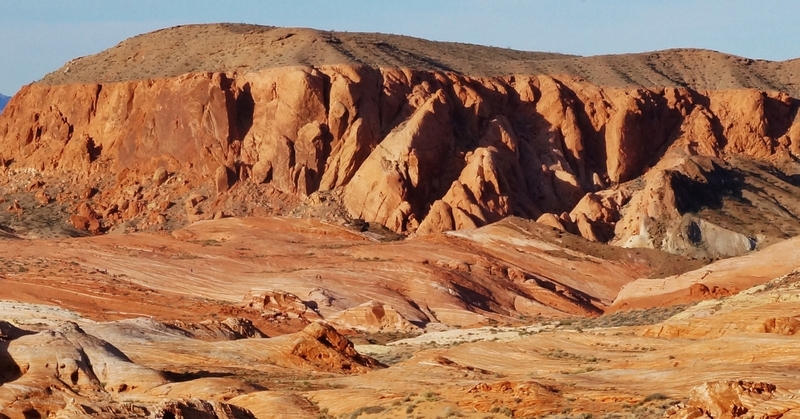 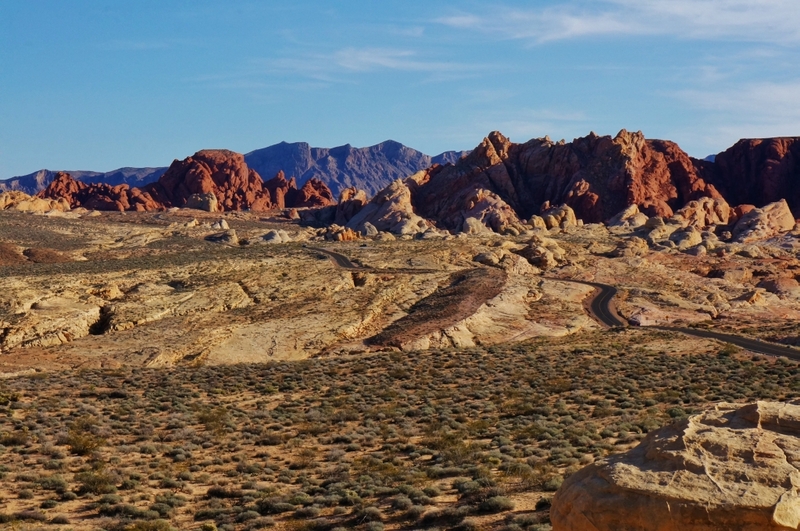 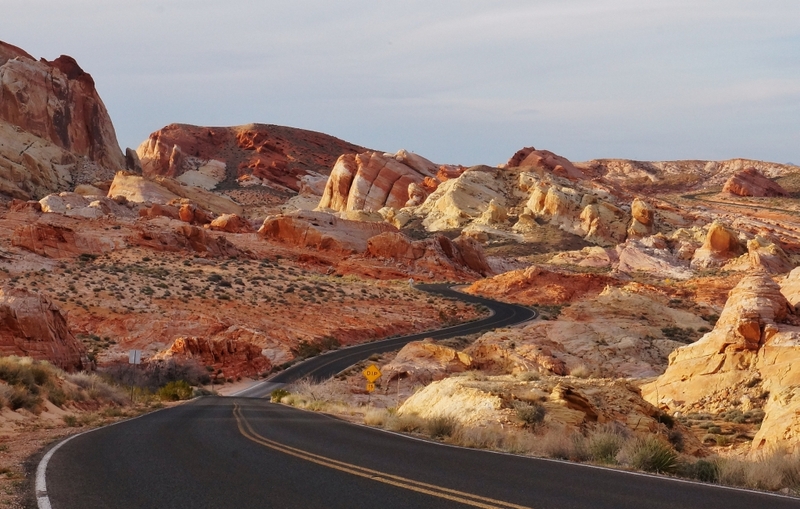 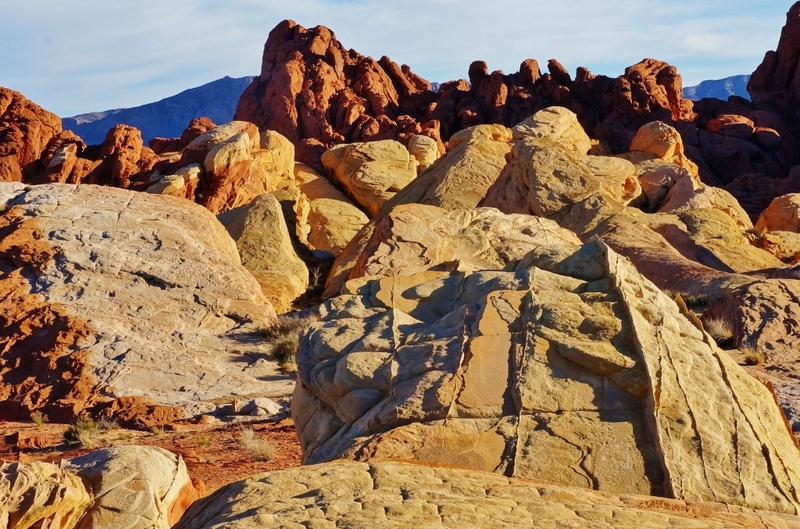 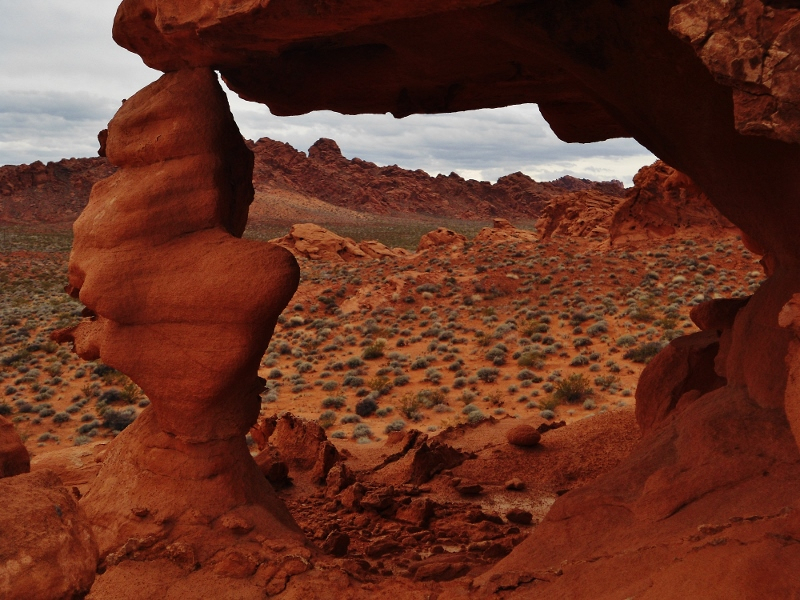 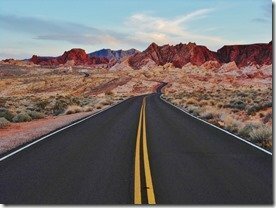 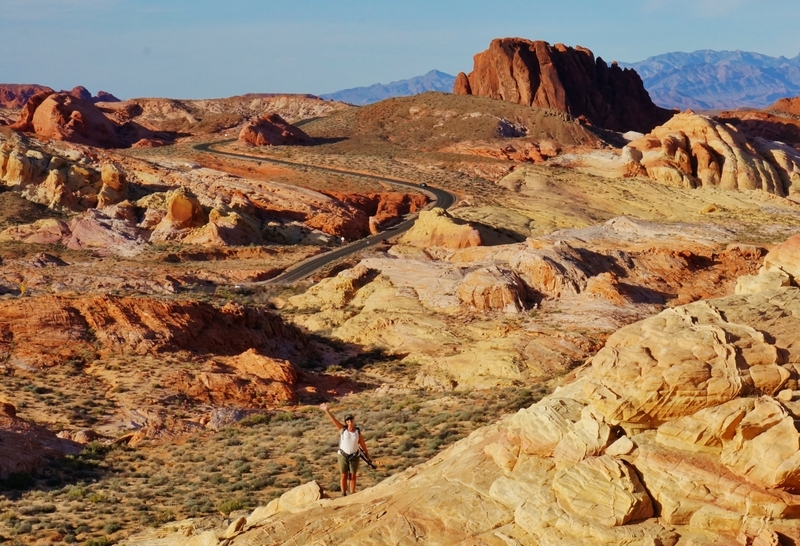 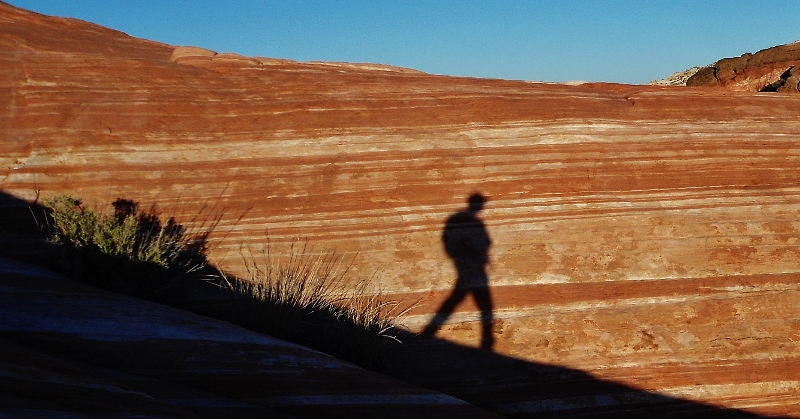 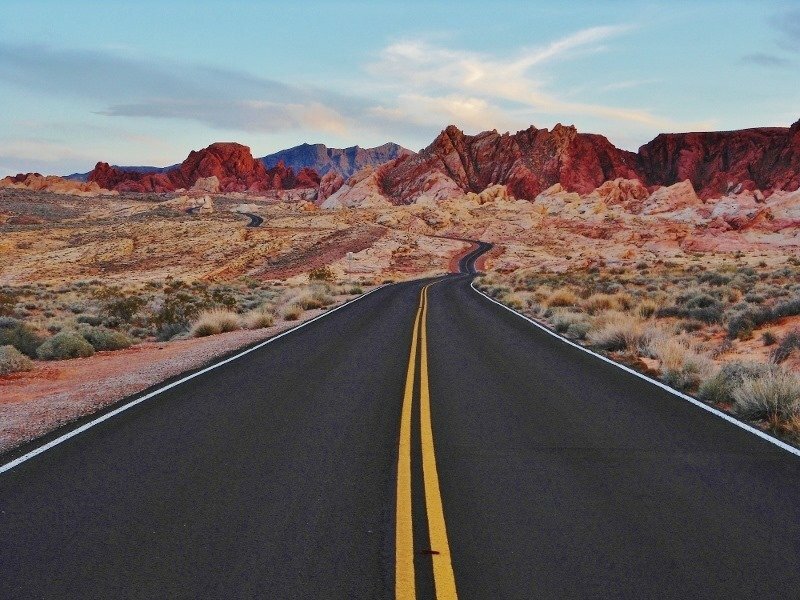 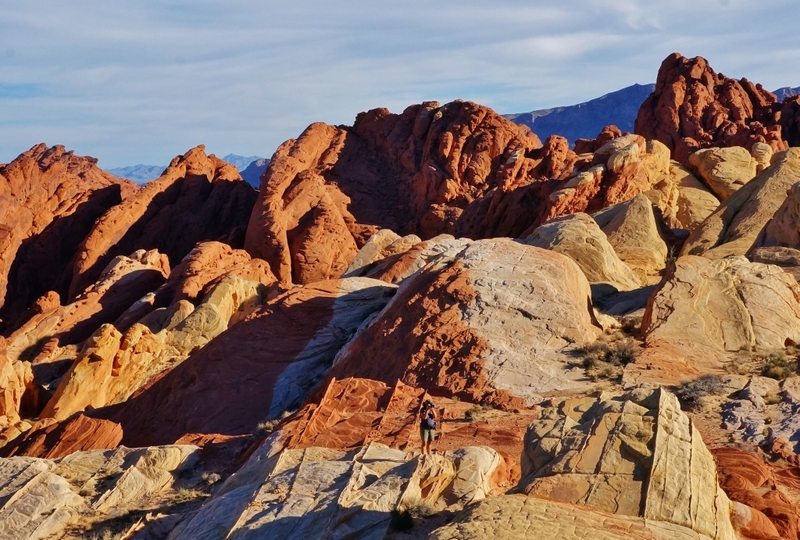 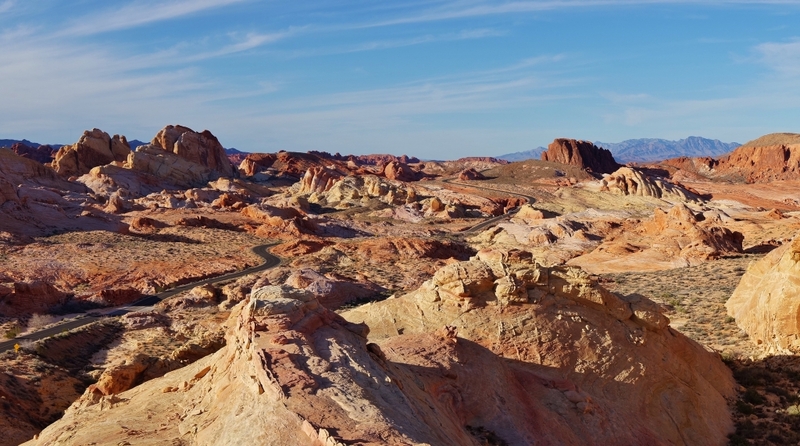 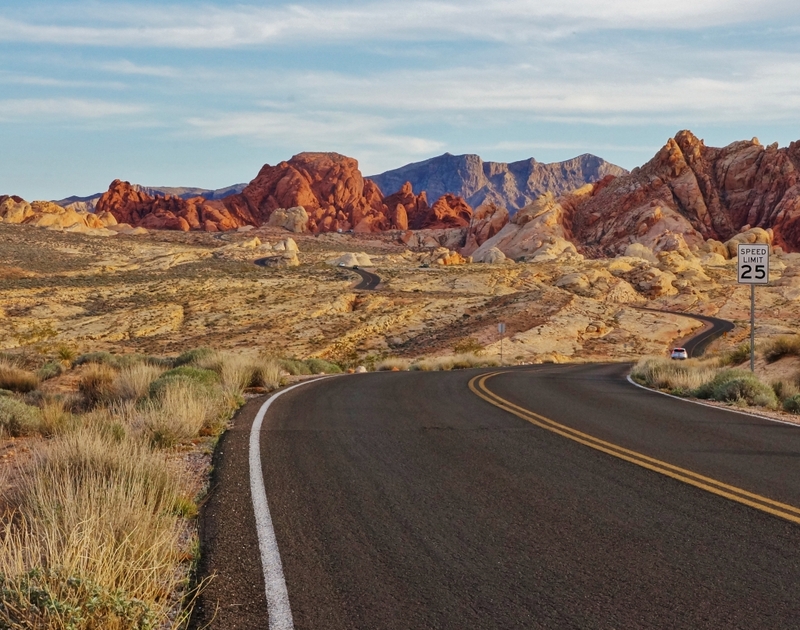 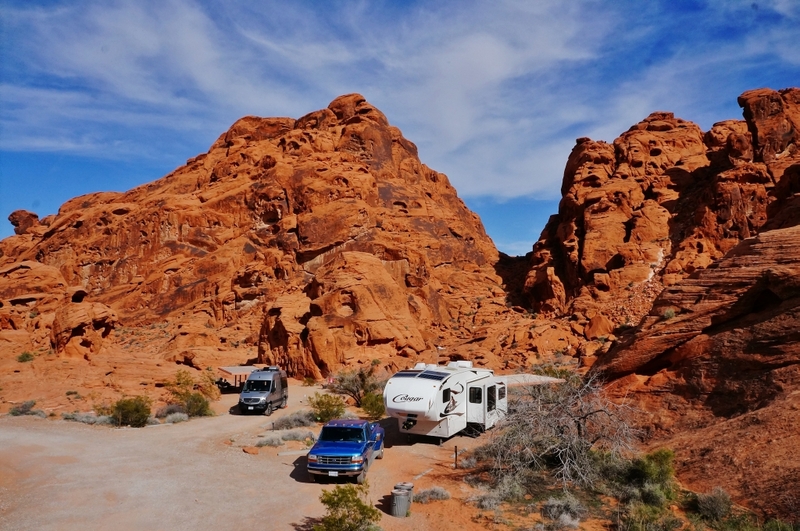 Just 50 miles up Interstate 15 towards Utah is Nevada’s oldest state park called Valley Of Fire State Park. 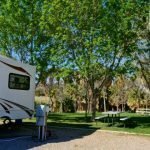 As luck would have it a follower of Anne’s photography blog named Don offered us a free RV site in his little campground in Moapa, NV not too far from the park. 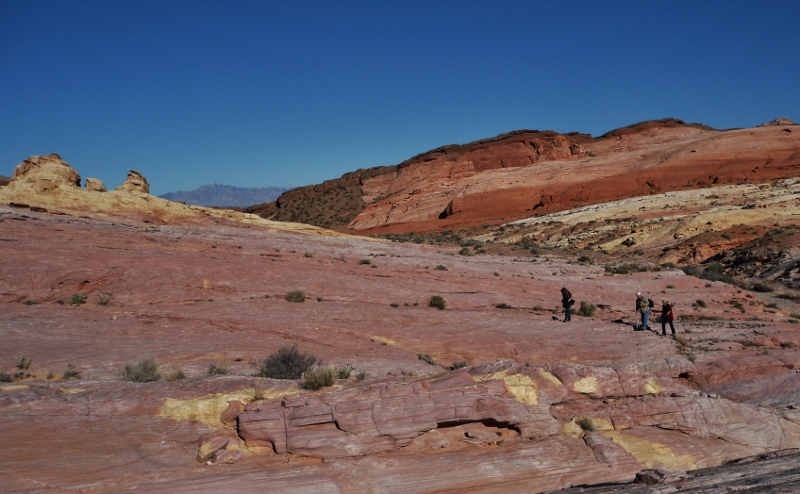 He also offered to show us around the park and some other special places in the general area. 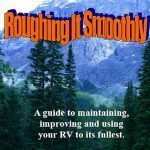 So it was an RVers dream! 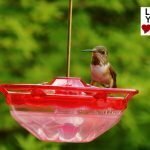 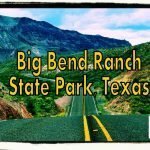 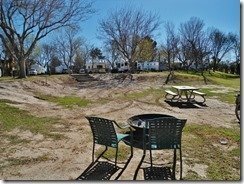 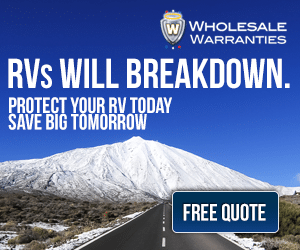 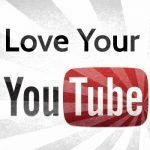 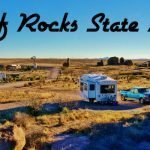 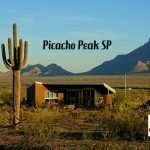 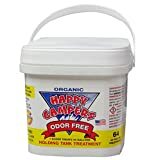 Free full-hookup RV Site in a nice campground and a local guide! 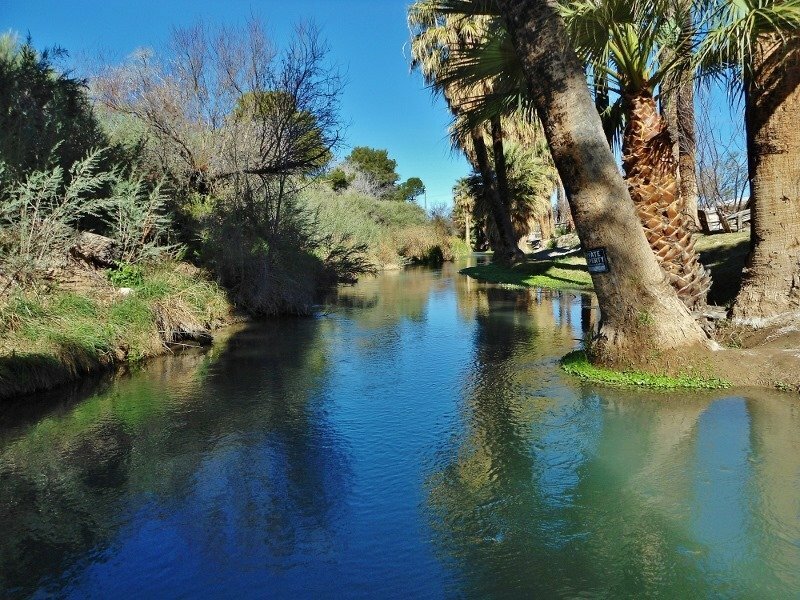 His property is well treed and has a natural warm spring running along side. 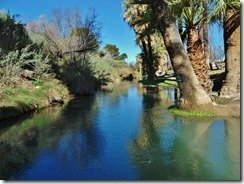 A little oasis in the harsh Southern Nevada desert. 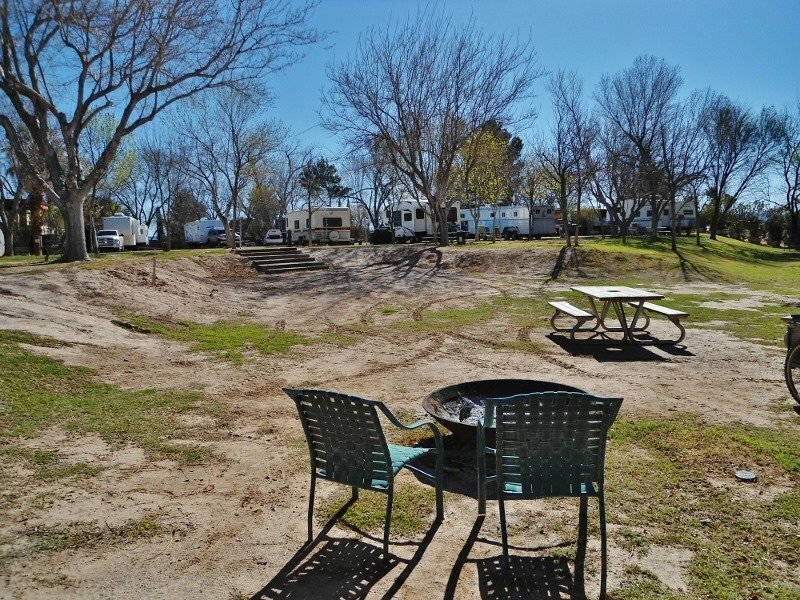 The RV park is called Palm Creek RV Park. 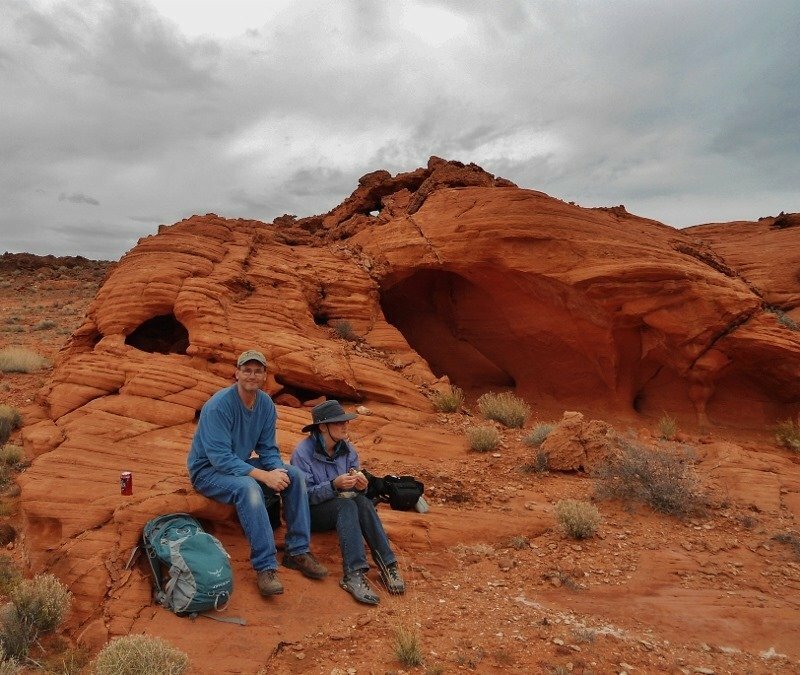 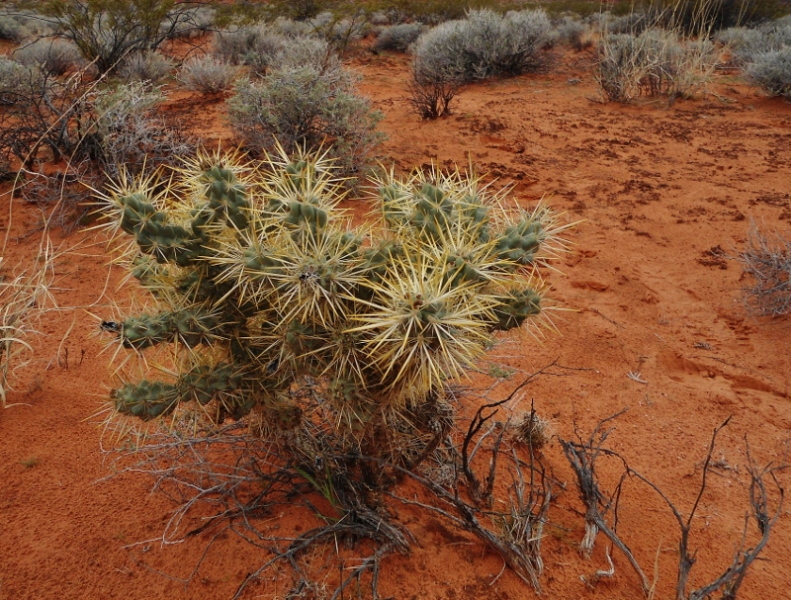 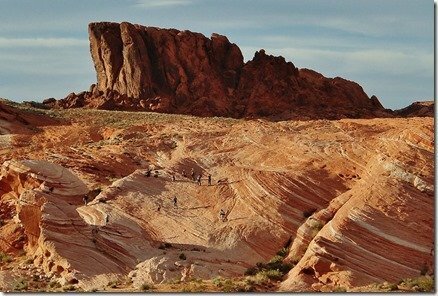 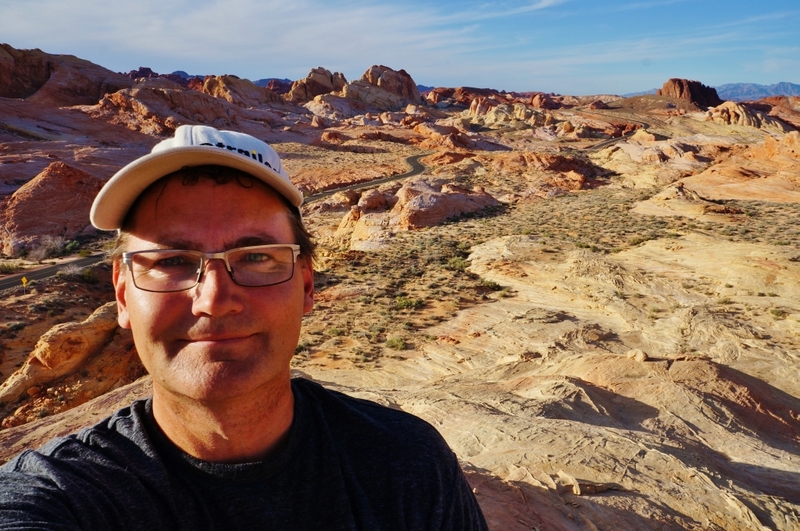 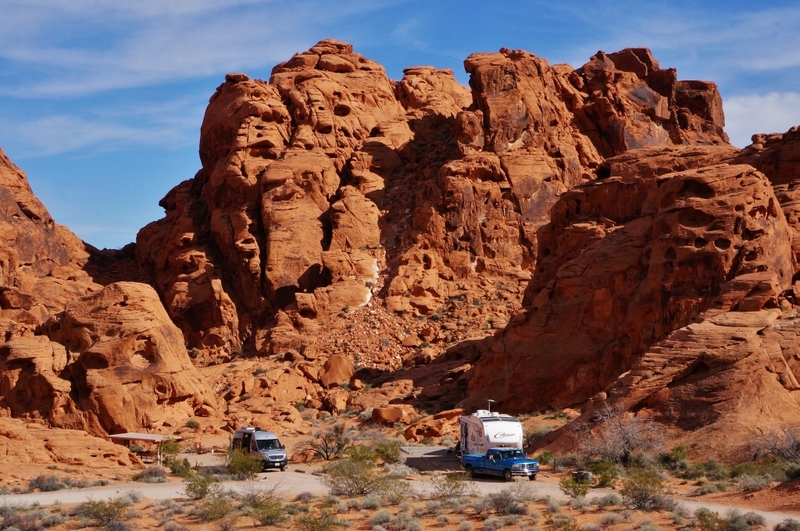 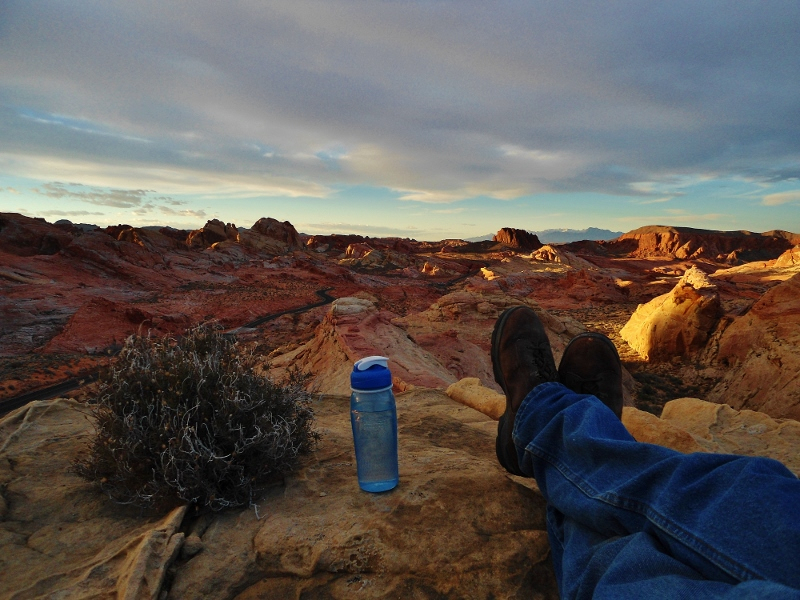 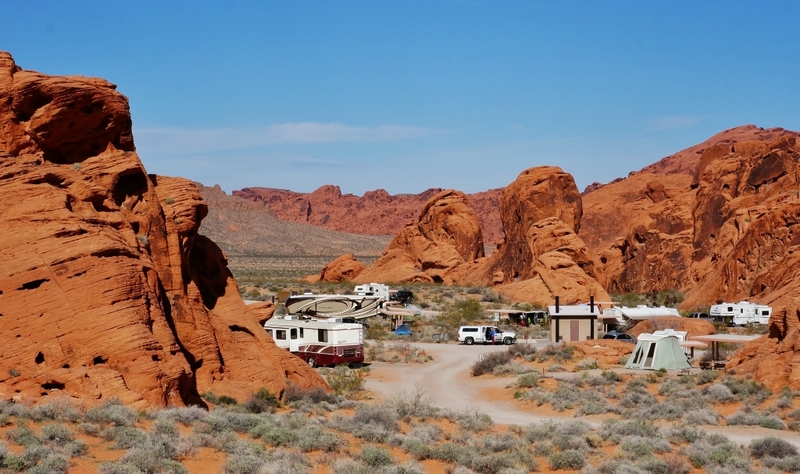 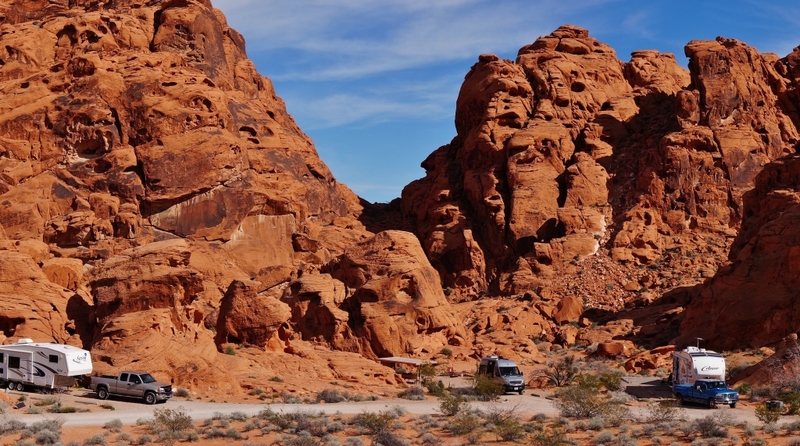 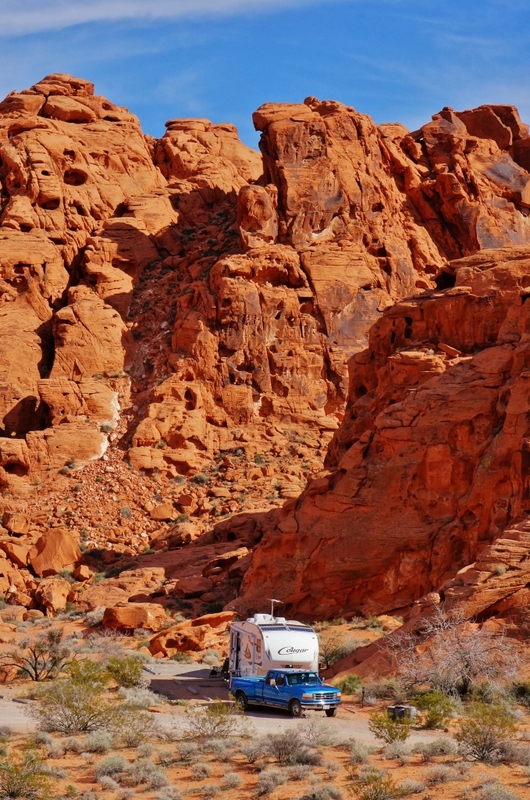 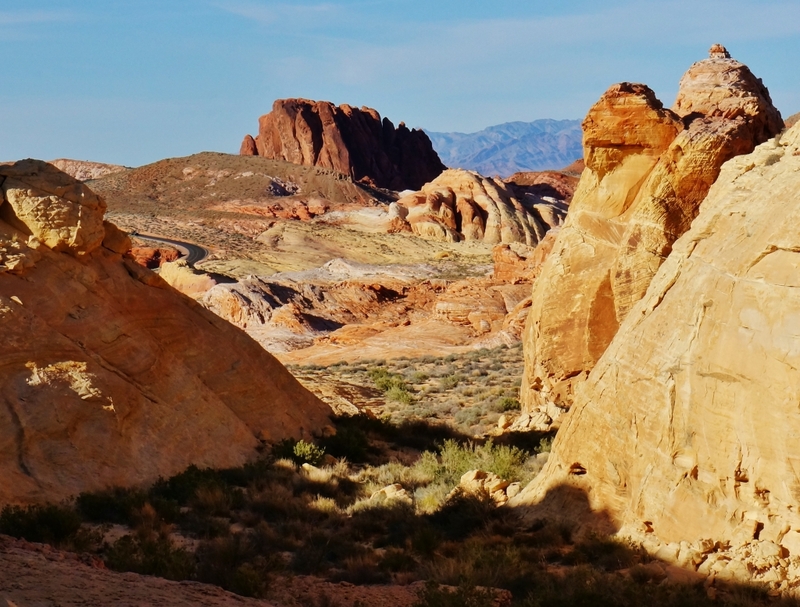 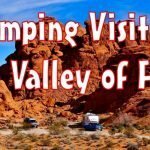 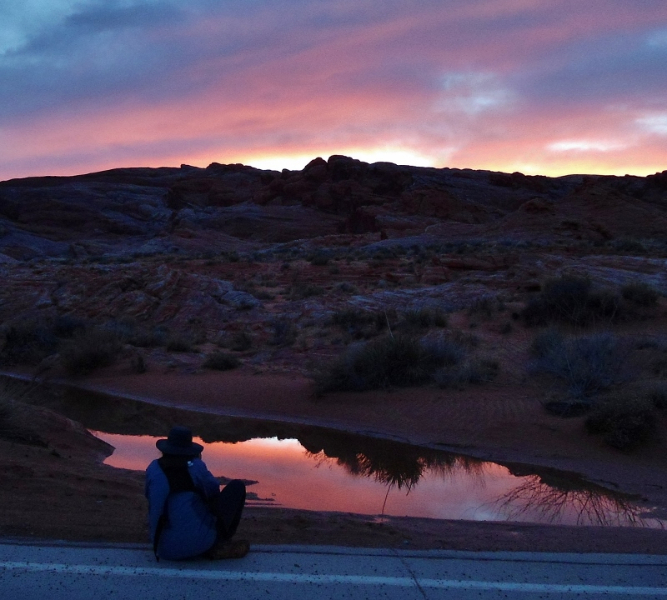 There are also nice camping spots inside the Valley of Fire State Park, in the nearby town of Overton and just south of Overton a great boondocking BLM area called Poverty Flats. 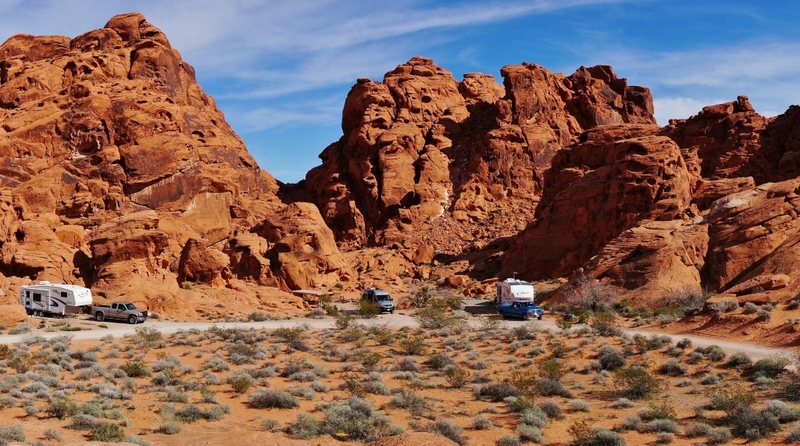 After visiting Utah, New Mexico, and Arizona it takes a lot to impress me when it comes to sandstone rock but Valley of Fire State Park is amazing. 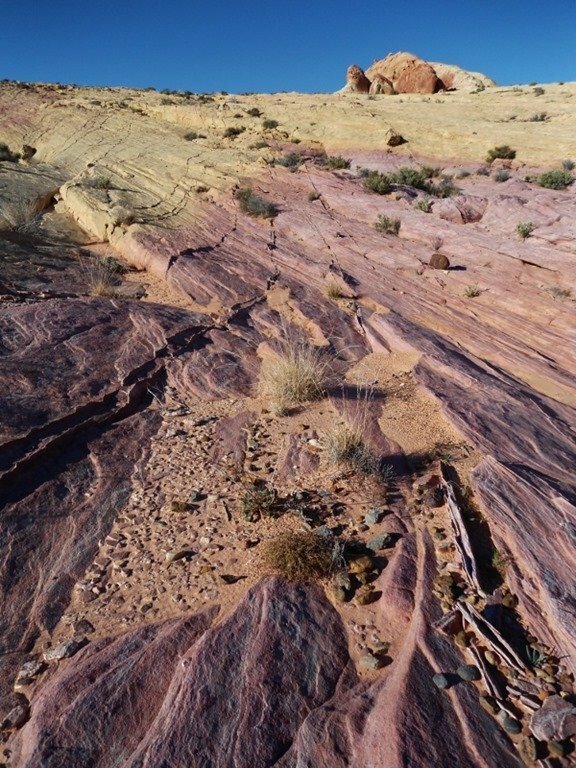 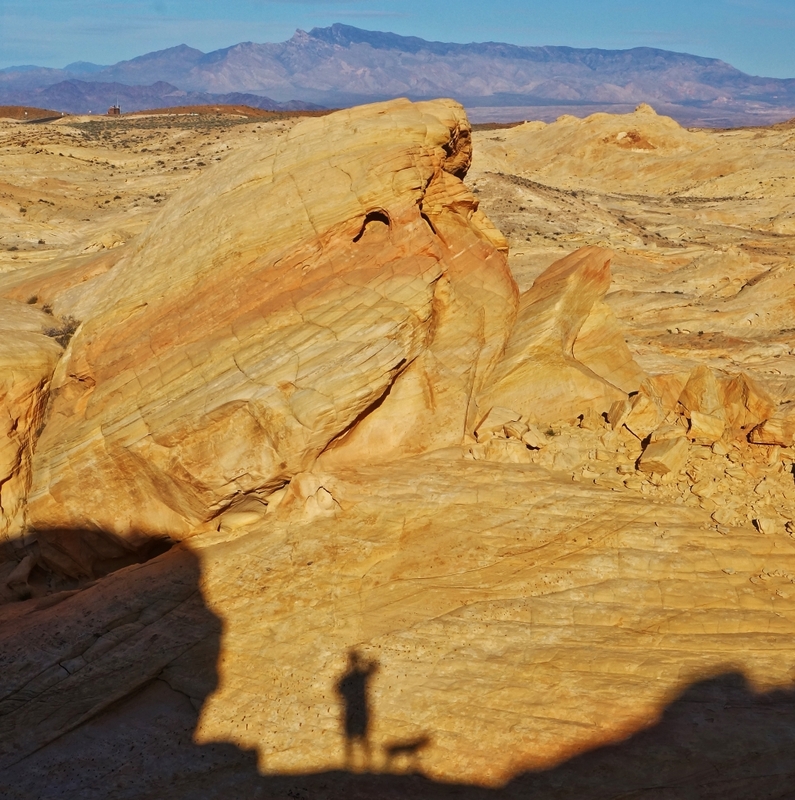 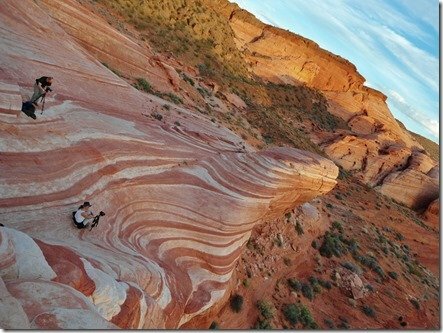 The park is not very large compared to many but is home to a huge variety of sandstone formations in all kinds of colors, shapes., and patterns. 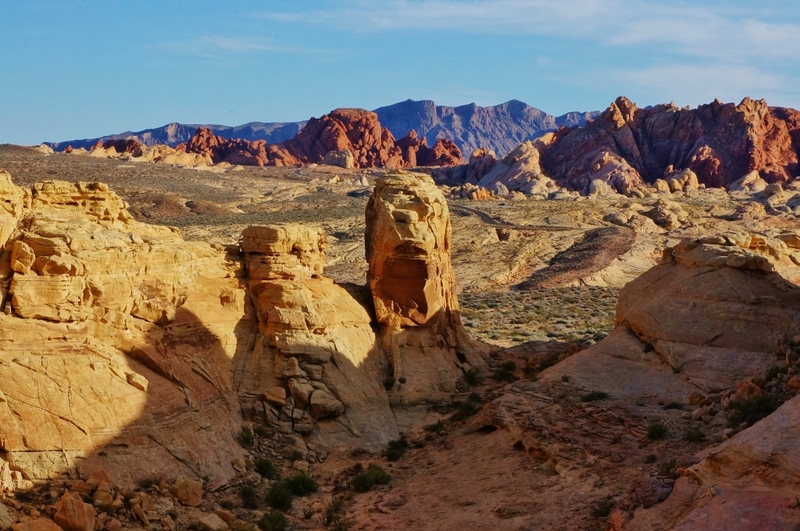 The west side of the park has remarkable deep red jagged hills complete with caves, arches, bizarre shaped outcroppings and sheer cliffs. 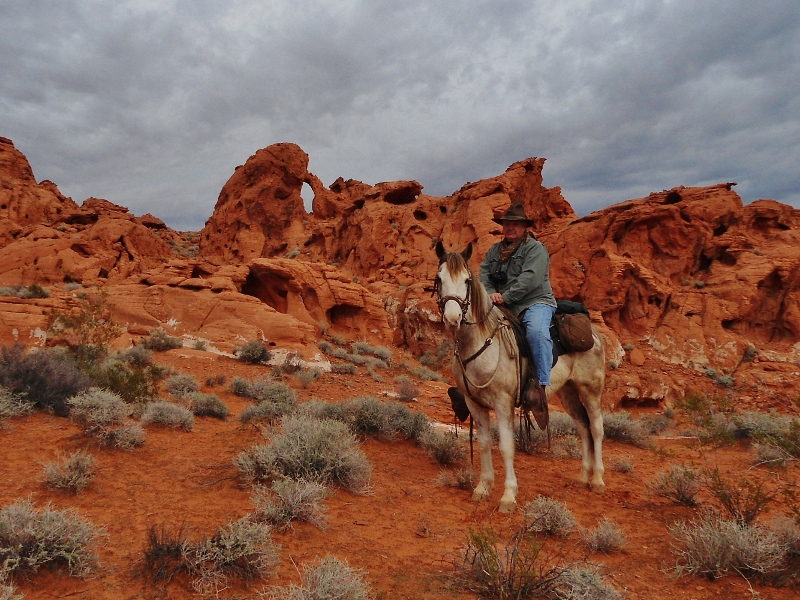 The first day we hiked up around this area with our guide Don who had brought his horse along. Seeing him riding his beautiful horse in this amazing desert landscape was really cool and just screams the US South West. Next, we visited the eastern part of the park which has a greater variety of colored sandstone, not only the brilliant red/orange type but gold, yellow, pink and mauve. 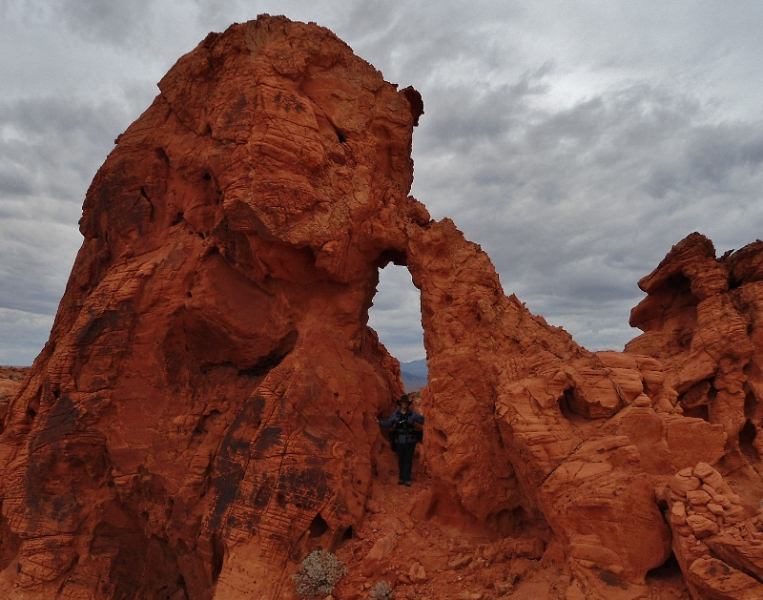 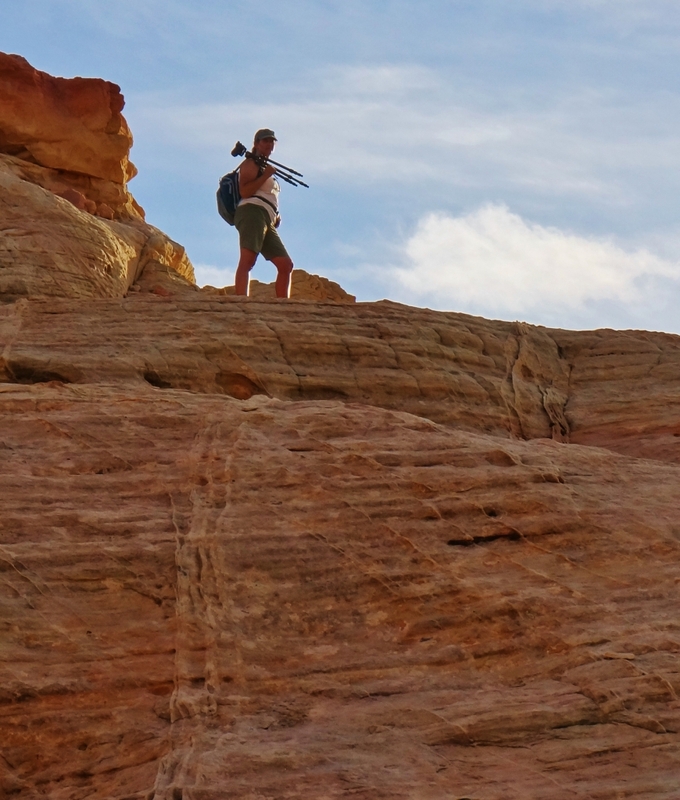 It was a blast to hike and climb around the rock formations and admire the beauty nature is capable of. 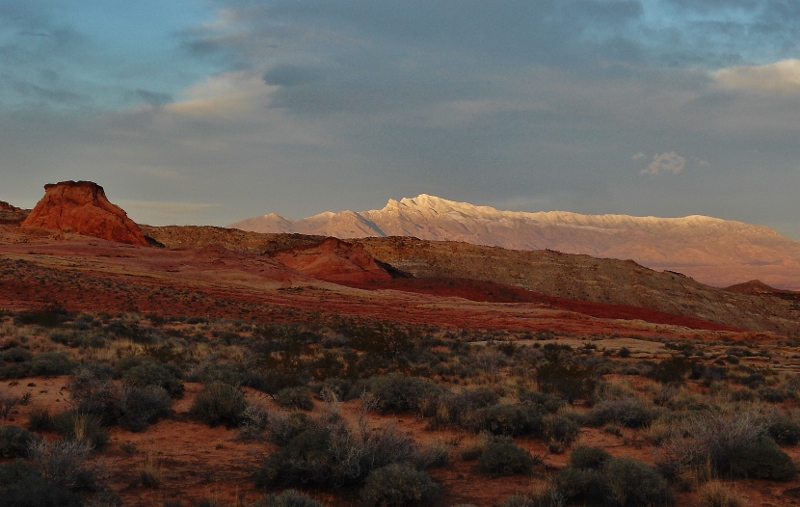 It had been a cloudy day but just as sunset hit a small area of sky opened up and the valley lit right up! 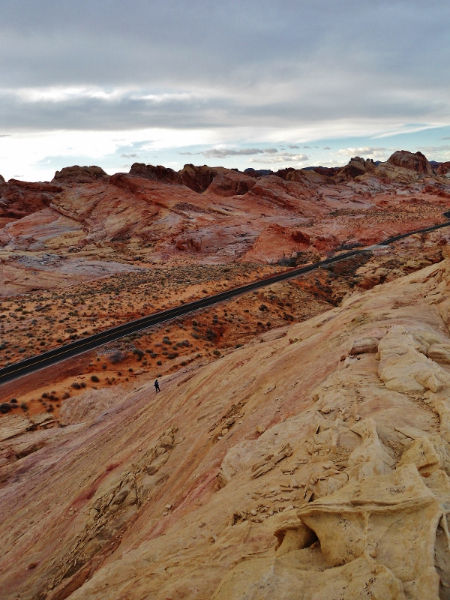 The paved road winding through the valley is an interesting sight and many car commercials are filmed here. 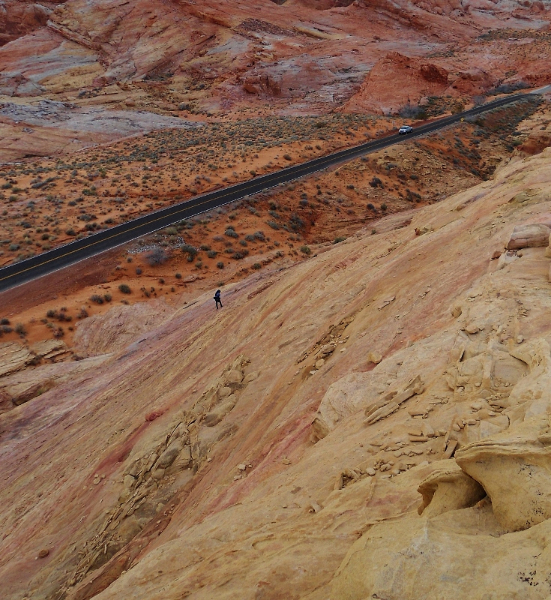 While there I was treated to a Lamborghini followed by a Ferrari roaring through. 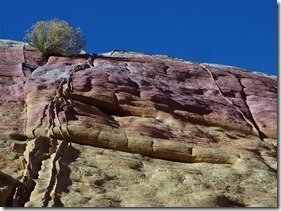 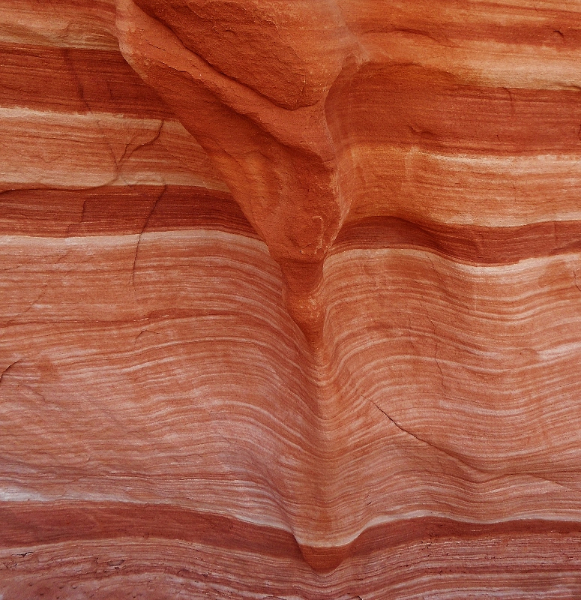 I could not get over the wild colors and patterns of sandstone in the park. 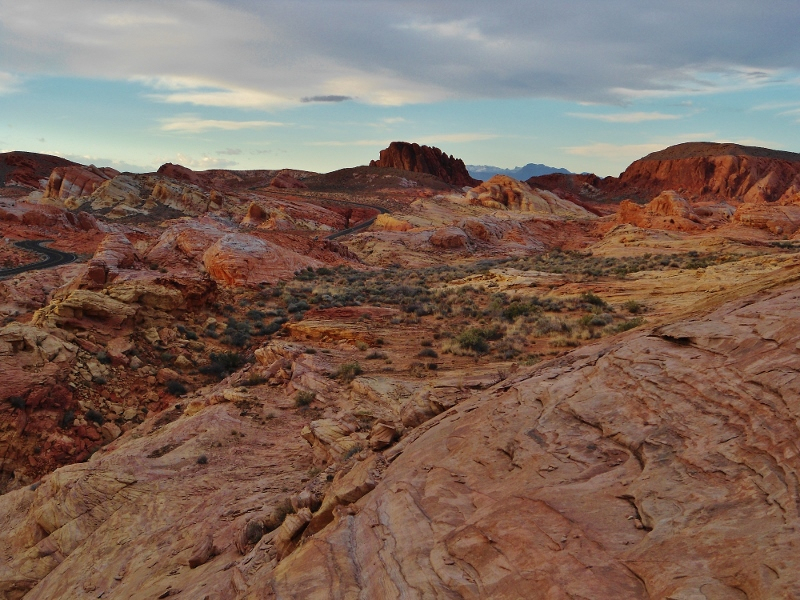 This truly set the area apart from any other I’ve visited. 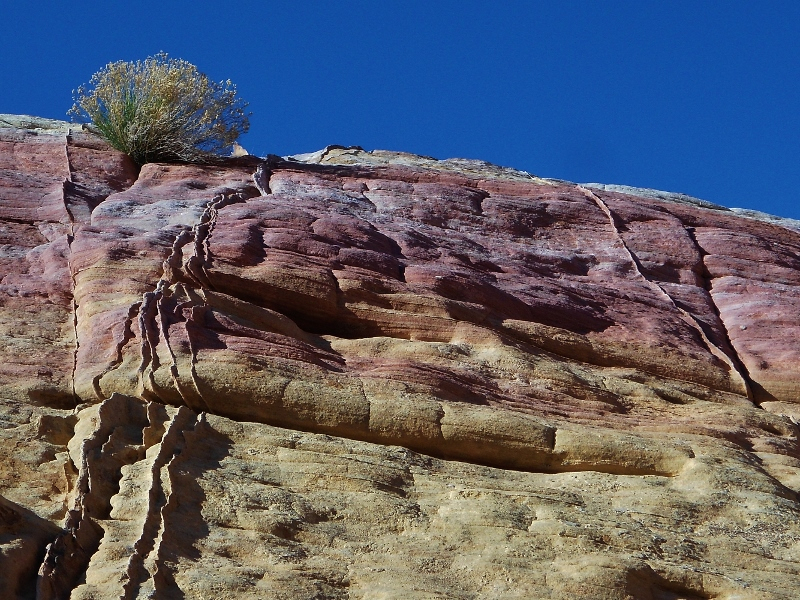 The mauve/pink bands were so unique and contrasted against the lighter gold sandstone, blue sky, and desert shrubs really made for a beautiful scene. 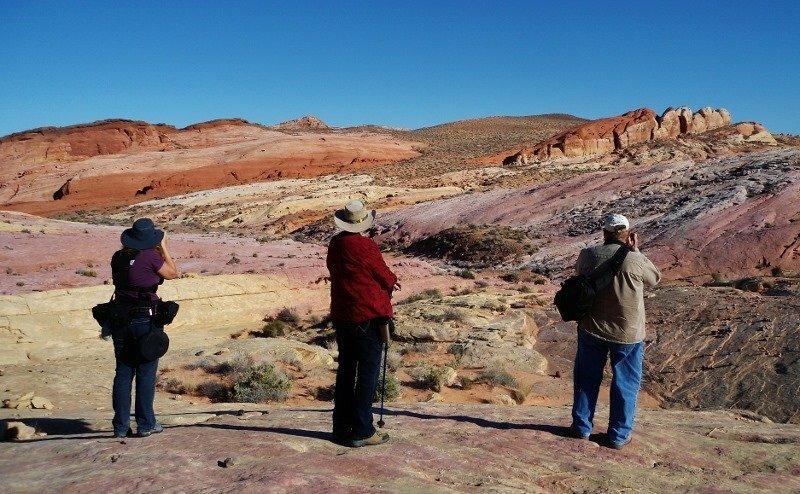 We spent one sunny afternoon with Don and another friend of his wandering the sandy washes and hillsides photographing and drinking in the views. 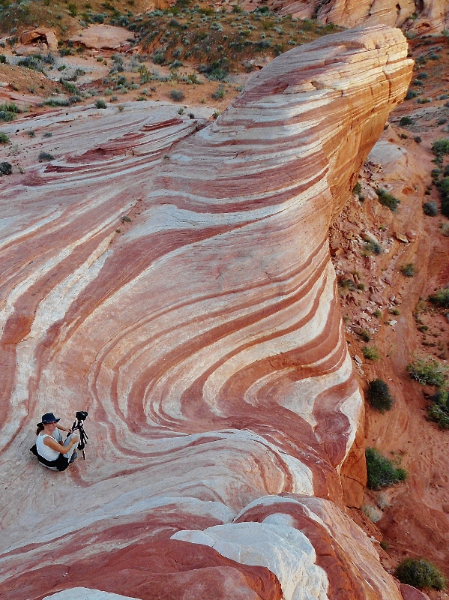 This park is a photographers paradise and many a shutter was clicked! 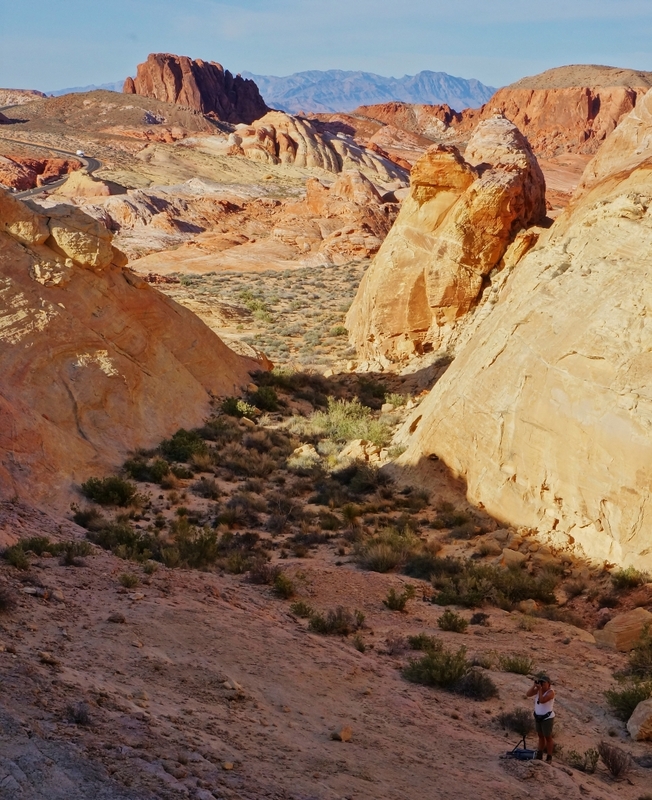 After seeing much of the park and thinking nothing could match it, Anne had a special surprise in store. 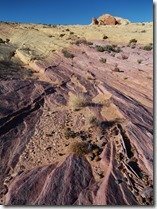 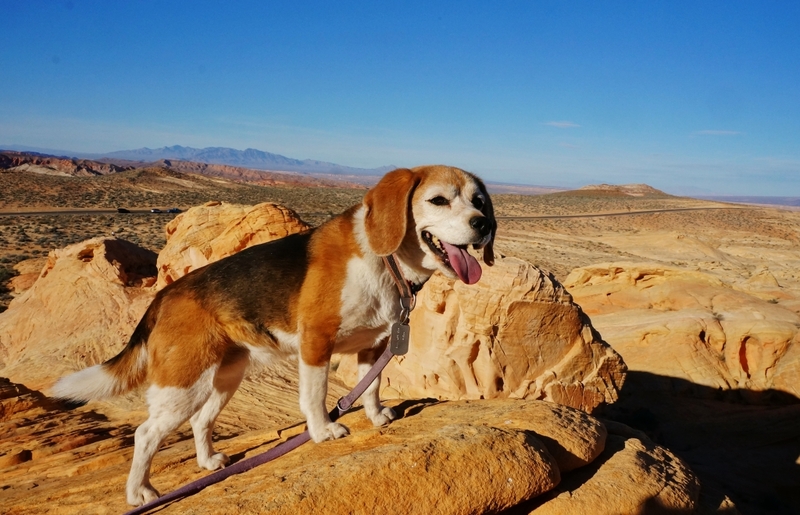 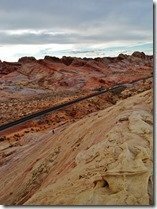 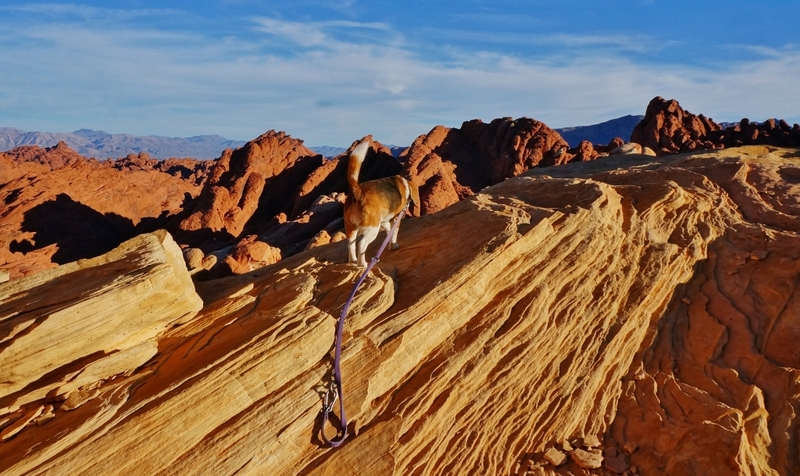 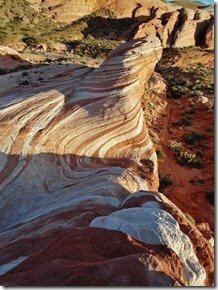 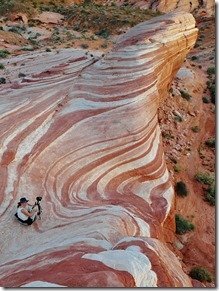 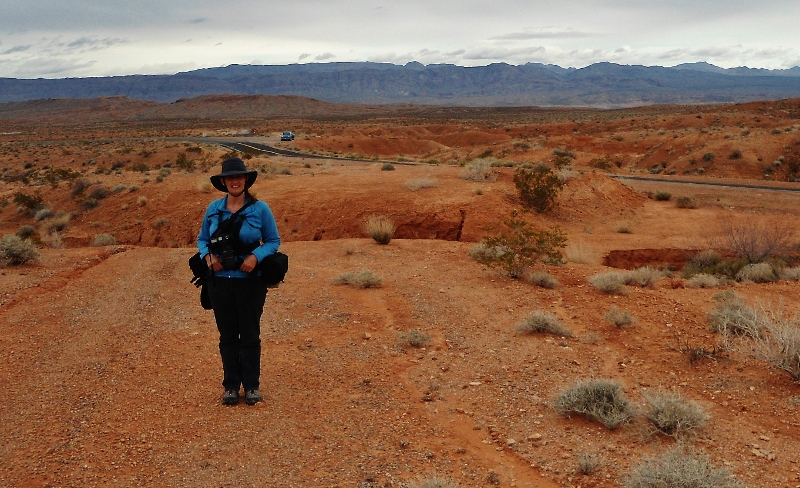 She had found out about a lesser known area inside the Valley of Fire called the Fire Wave. Upon seeing the photos in an eBook she downloaded we set out to find it. 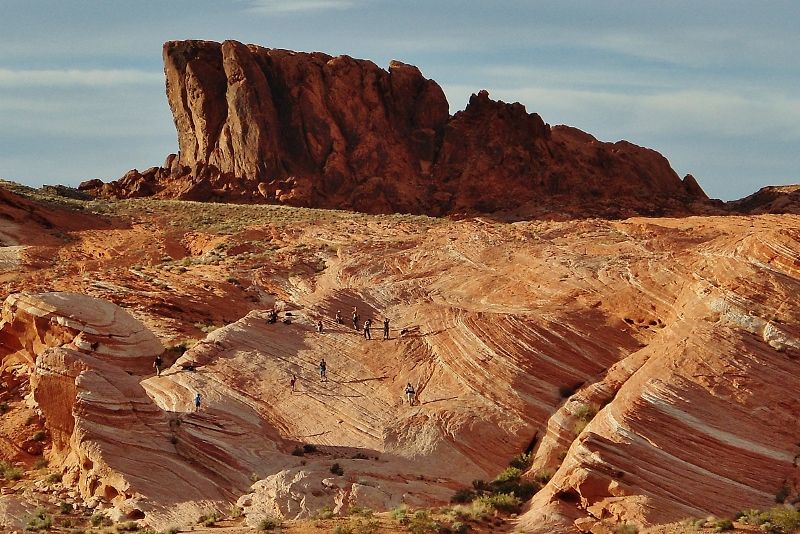 Actually turns out it wasn’t so hard as the park recently installed a trail to the special spot. 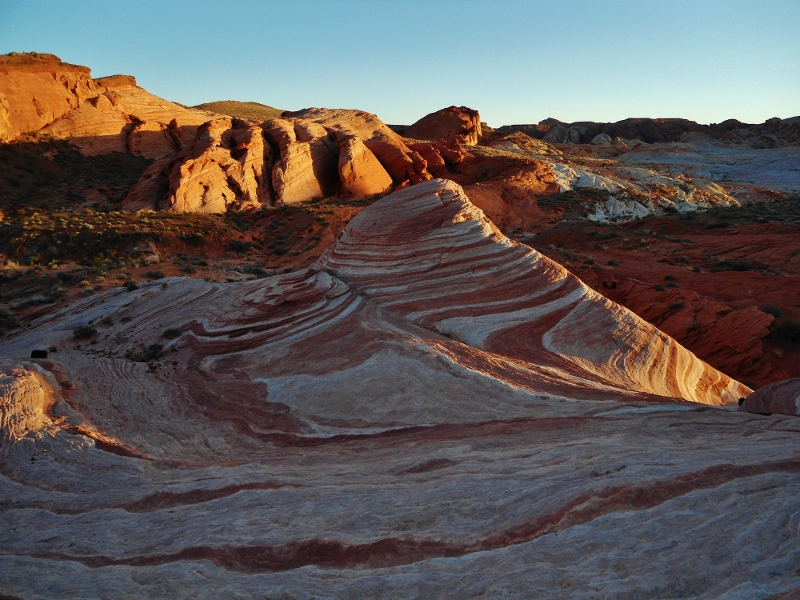 Out at the end of the road to White Domes is a marked path leading down past Duck Rock to the Fire Wave. 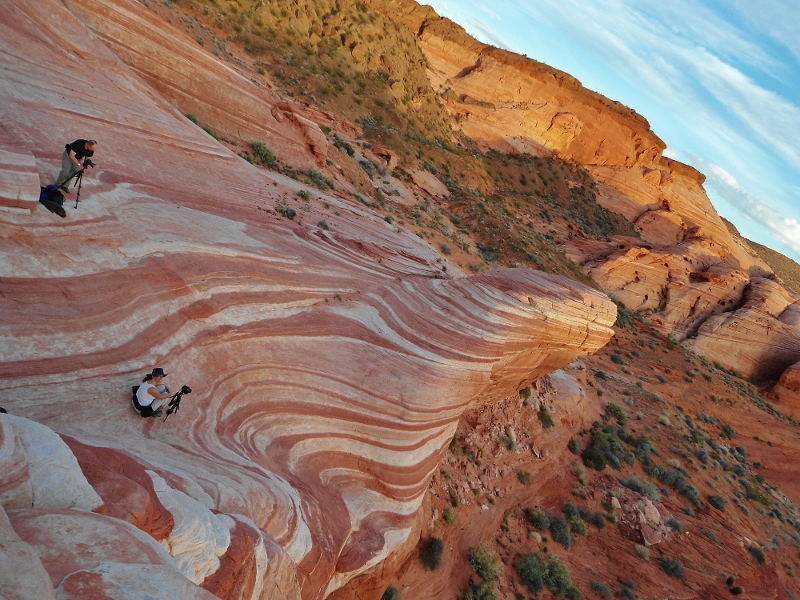 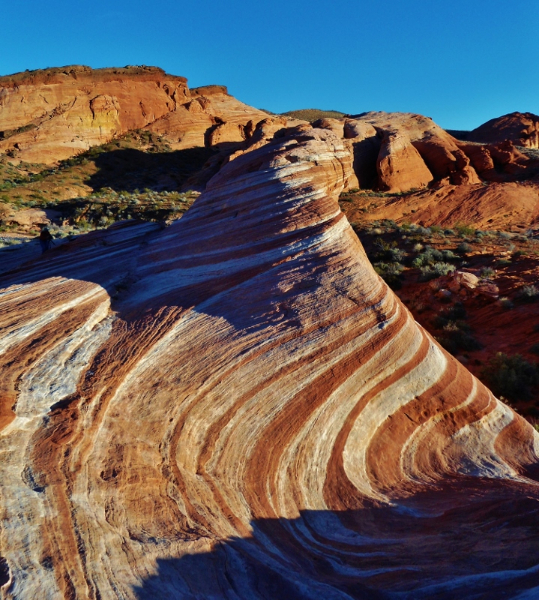 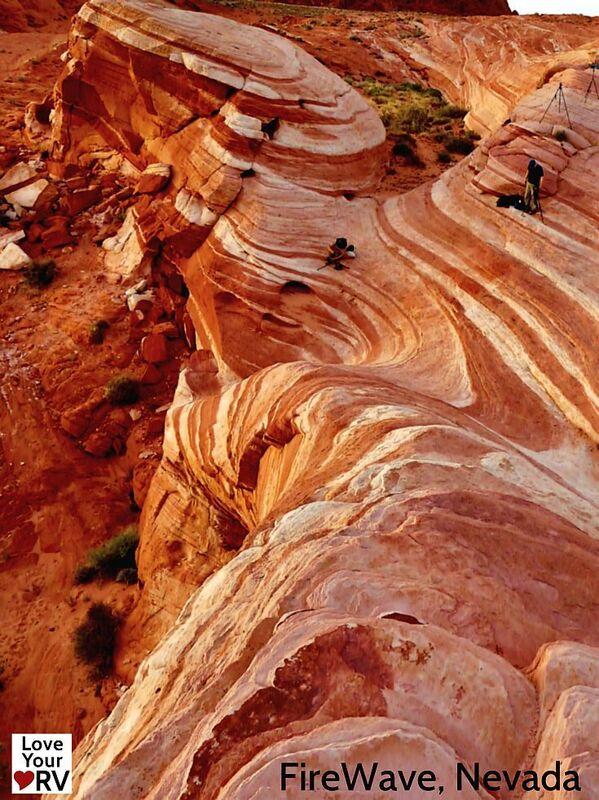 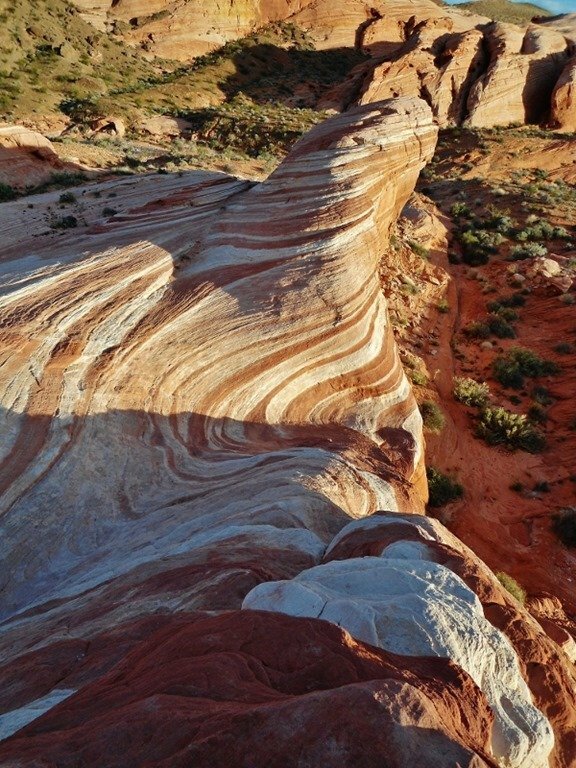 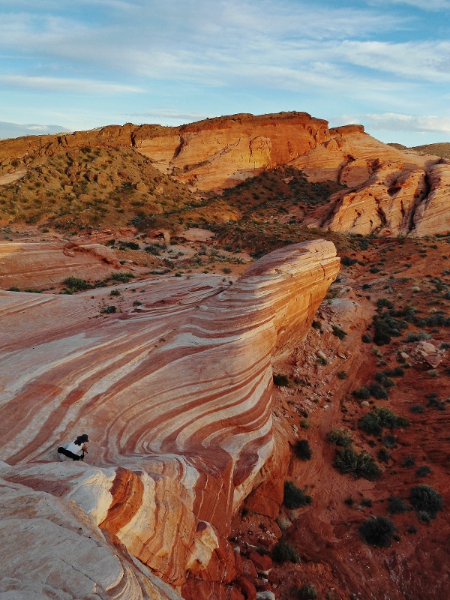 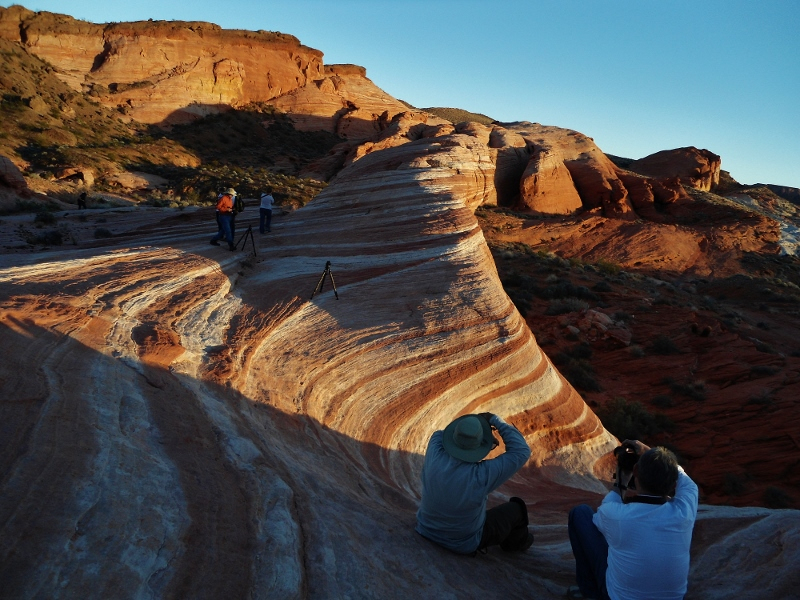 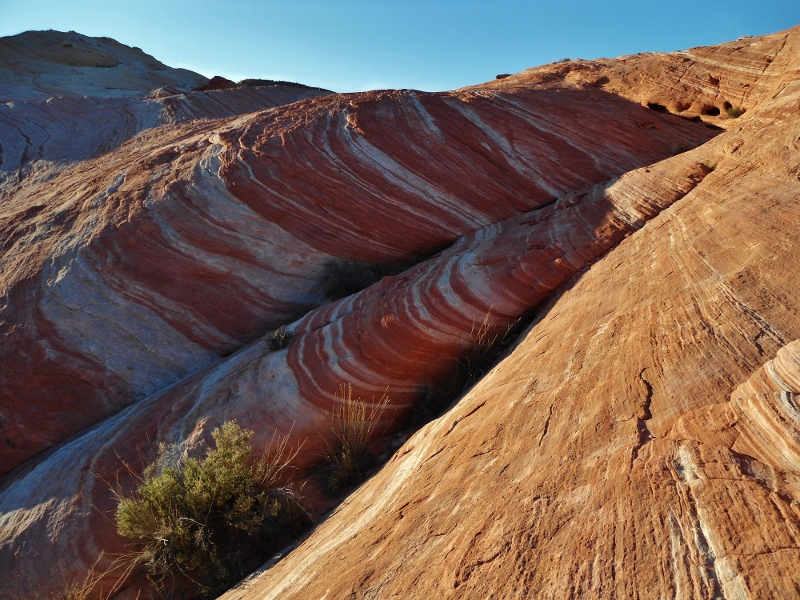 Fire Wave is an outcropping of banded red/orange and whitish sandstone that swirls around the landscape in the most impressive fashion. 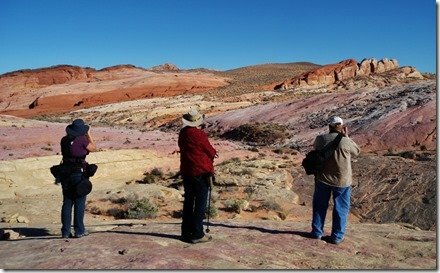 A favorite place with photographers. 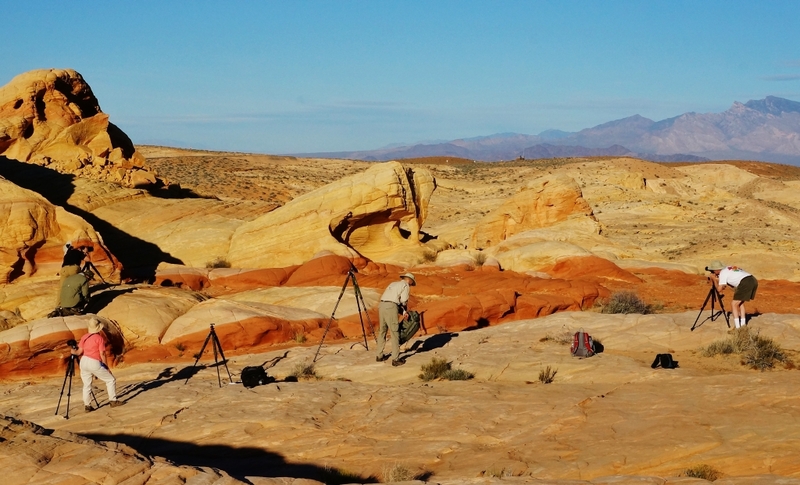 Both times we ventured down to see it there were at least 6-8 people with tripods clamoring to get the best angles. 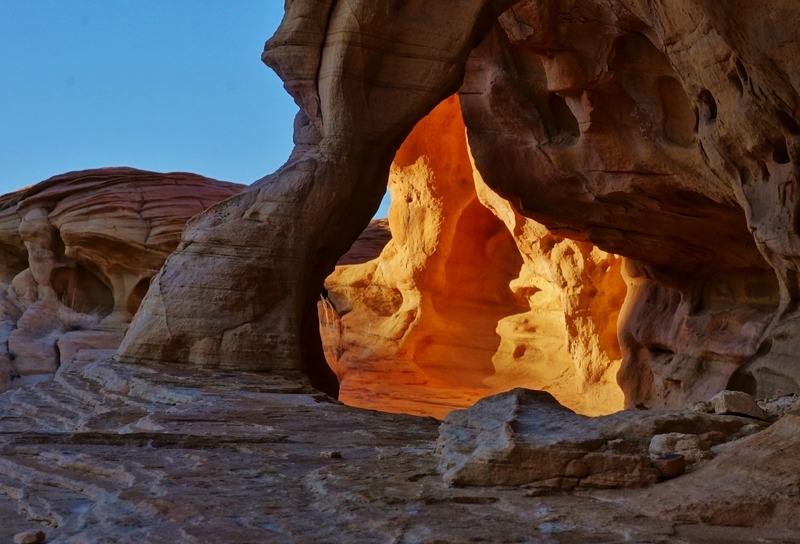 At the right time of day the light softens and the scene becomes magical. 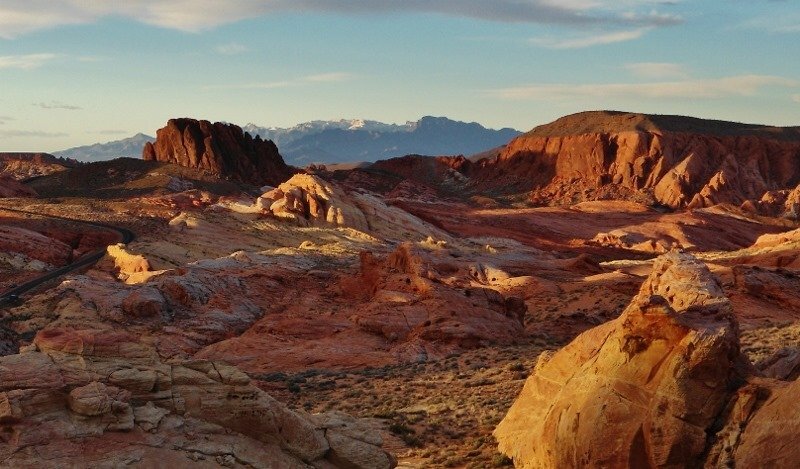 It’s hard to imagine such a place can exist. 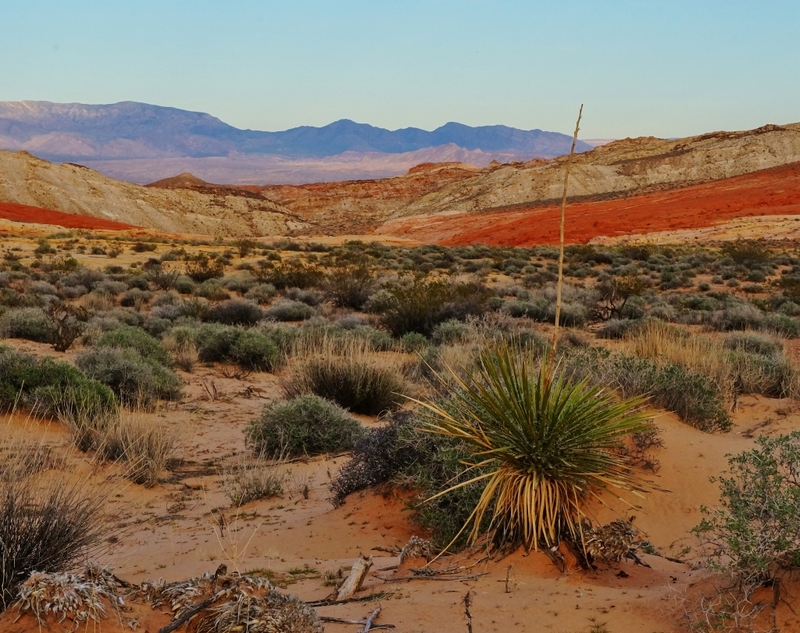 It appears more like a yummy ice cream dessert than a desert landscape. Nature never ceases to amaze me. 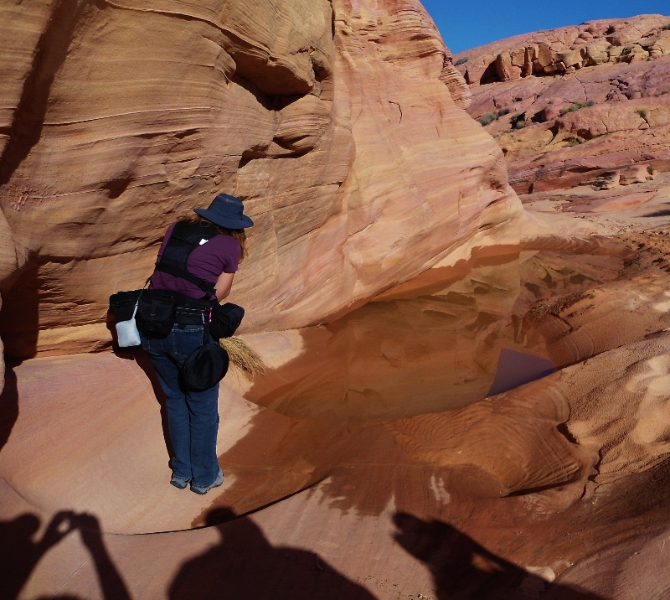 Anne staked out a spot right down in a dip with her wide-angle lens to capture the best angle as the light and sky changes.